Its origin is shrouded in mystery, as the word itself appears in no translation of the Bible. There is no scripture verses that can really be offered to proves its existence. Nor did Jesus or any of the apostles or prophets make any mention to this. To date evidence can only be found that Pope Gregory the Great (590-604 AD) conceived this unbiblical doctrine of purgatory. It was then ratified in 1439 AD at the Council of Florence. For Catholics the dilemma arises, that they feel they are not bad enough to be sent to hell and not good enough to be sent to heaven. Instead of attempting to find the way to ensuring their practitioners entry into heaven, the Vatican came up with a make believe place of temporary residence. 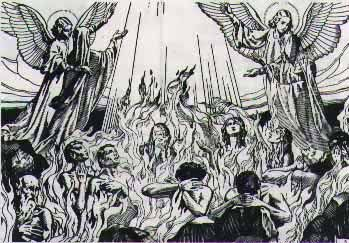 According to Catholicism, ALL saved persons, no matter how good or devote, must spend a period of time within Purgatory's purging flames. Catholics can only hope to shorten their stay not avoid it completely, which is were paying or buying indulgences come into play. The very existence of Purgatory over the generations has not only ensured the Vatican with an unending source of income, but has made her extremely wealthy beyond belief. Obviously no one ever wants to mess with the goose that lays golden eggs even if it goes against God's holy word. Instead of giving proofs for Purgatory's existence, Catholicism instead only points the fact that there has never been any protest against this doctrine centuries since its conception. Of course just because something has been in practice for generations doesn't necessarily mean that it is correct. For an example of such, one only has to look at the centuries long held fact that the Earth was flat and the center of the universe. Of course it was Vatican who declared it a heresy for any person to hold to any view contrary to these two opinions. She actively would hunt down, persecute, and even kill scientist who found contrary information. The Vatican stated for centuries that the scripture did not back any opposing view. Likewise the Vatican has a habit of silencing all who do not agree with their point of view. Therefore the absence of protest against the doctrine does not necessarily mean support and endorcement. How long must one stay in Purgatory? One main problems for Catholics is how long will anyone have to burn there for? The problem is no one knows. Not even the priest and the popes can say for sure. 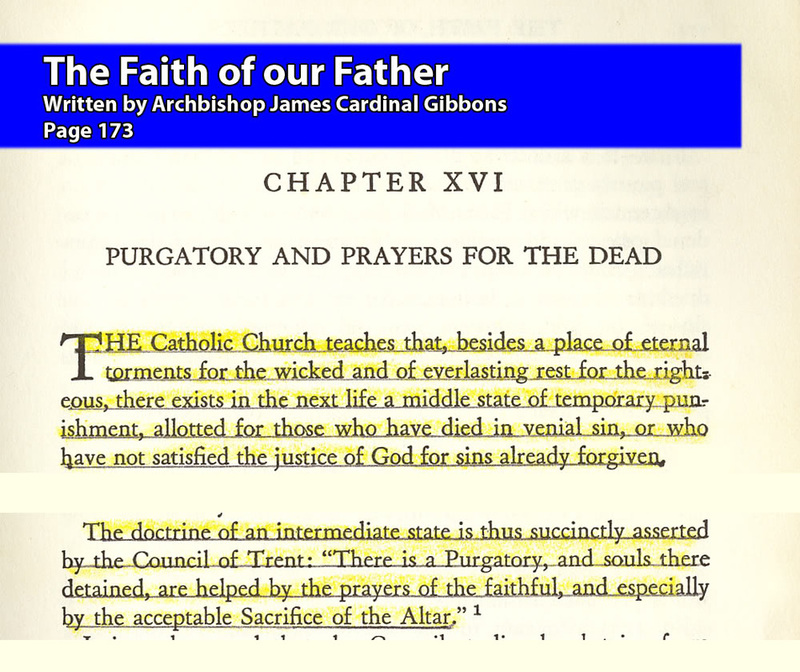 Of course the fact that Scripture makes no mention of Purgatory, much less offer a formula for determining one's time required in Purgatory, doesn't put devote Catholic minds at ease. According to official Catholic teachings, the vicar general of the Dominicans order has been in purgatory for 500 years now. If someone so senior has been burning there for so long, that even Pope John Paul II pleaded with his Polish crowd in 2002 to pray for him before he died, what chance does the common laity have? Doesn't the Catholic Church or Pope have the power to forgive sins? According to Catholic tradition, Jesus gave the keys of heaven to Peter, whom the Vatican's succession of popes came from. The pope is given the title of Vicarius Fileo Deo meaning Vicar of Jesus Christ. Simply put this makes Him the representative of Jesus on earth with all the powers and priviledges that it entails. This means, according to Catholicism, the pope has the power to forgive sins just like Jesus. For the moment let us forget about the blasphemy of this claim, as the Bible says only God can forgive sins. Rather let us look at it as if this claim is true. If the pope or even priest can forgive sins, then the person whose sin was forgiven is clean. "God forgives sin (through the agency of His priest) ... but does not take away the "temporal penalty" associated with it. Your penance assigned at confession is associated with the latter. (a) In essence Purgatory is an admission that God's forgiveness is insufficient and the power of the priest and pope is impotent. The entire point of being Christian is to find forgiveness from God to avoid punishment. If God can't give it and the pope can't give it, the whole system doesn't work. 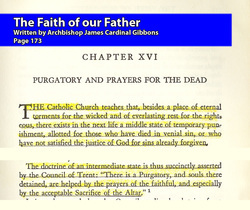 If the Church was truly given the power by Jesus to forgive sins, a simple declaration should be sufficient to prevent anyone from even going to Purgatory, in the first place. Yet is this what the Church preaches? No it is not. And even worse they state, almost as a fact, that everyone must go through an unspecified amount of time in Purgatory before being allowed into heaven. But all hope is not lost for the devote Catholic. For with a large enough sum of money to the Church one could be declared forgiven and years subtracted from your stay in Purgatory by an indulgence issued by the Church. What a tidy little system Catholicism has made to enslave their own people! You are offered no security of salvation. Instead you are given a system to constantly pay into, trying to escape a fate that has no definite end and worse yet no escape. Meanwhile the Church simply makes billions while its parishioners buy pieces of paper that they can't even carry with them into the next life. As you see already there is no real proof for Purgatory in God's Holy Word. And even less is known on how to avoid it. 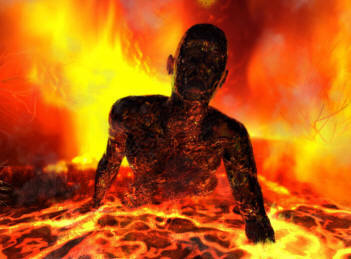 However the good news is that according God everyone can easily avoid this make believe place, as well as the very real place of torment, Hell with one simple step. That step according to the Holy Scripture (even the Bible Catholics are allowed to use) is to accept Jesus Christ as your only Savior and mediator between you and God. God's way to assure you of heaven is simple and direct. There is no complex rituals, nor prayers to recite, nor amount of money to pay to get to Heaven. There isn't even any unknown periods of burning required. All your God requires is that you believe in Jesus as your Lord and Saviour and you are saved (assured of Heaven. Won't you accept that free gift today by praying from to Him?